The Association for Human Rights in Ethiopia (AHRE) is pleased to announce the launch of its new report, “Ailing Civic Space in an Authoritarian State: The State of Human Rights Defenders and Cost of Dissent in Ethiopia.” This report aims to provide an overview of the situation of human rights in Ethiopia and to examine the increasingly restricted space in which human rights defenders (HRDs) operate, with particular attention to trends that have developed since the adoption of a series of repressive laws in 2009. While the Ethiopian government has made considerable strides in economic development, space for human rights dialogue has gradually disintegrated and many HRDs now face detention, torture, and harassment, while growing numbers now choose life in exile rather than remaining in the country. After the highly controversial 2005 national elections, the Ethiopian Parliament enacted legislation that dramatically narrowed space for civil society, notably the Charities and Societies Proclamation, Mass Media Proclamation, and the Anti-Terrorism Proclamation. These three laws have been heavily criticised for their restrictive provisions, which limit the work of journalists, HRDs, and civil society organisations through broad language and severe punishments. Over the past two years, Ethiopia has been rocked by growing protest movements in different parts of the country, notably in the two most populous regions of Oromia and Amhara, and to a lesser extent the Southern Nations, Nationalities, and Peoples’ Region (SNNPR). Security officials responded to these mass protests with excessive force, which resulted in the killing of over a thousand people and the arrests of tens of thousands of demonstrators since 2014. These actions triggered timid condemnations from Ethiopia’s key partners and outcry from international human rights bodies. The widespread and deadly demonstrations led the government to declare a State of Emergency in October 2016 that lasted 10 months. 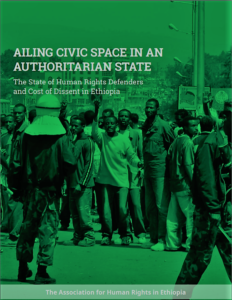 This report aims to document the deterioration of civic space in Ethiopia and the restrictions on HRDs, activists, bloggers, and other media professionals, which can be seen as roots of the current political crisis. This includes actions undertaken to limit the actions of non-governmental organisations, journalists, lawyers, and other professional and non-professional activities that aims to further the cause of human rights. By documenting the deteriorating human rights situation in Ethiopia, it is the intention of AHRE to provide human rights institutions, civil society, and concerned bodies with adequate source material to direct their efforts in addressing the overall conditions of HRDs and work towards rebuilding and strengthening civic space in Ethiopia. The report also features key recommendations to the government of Ethiopia, European Union, African Commission on Human and Peoples’ Rights, United Nations, donors, and allies.